The well-known hydrologist, J S Rawat, recently warned that the Himalayan region is moving towards the incipient stage of desertification, threatening the sustenance of the mountain ecosystem. There have been unambiguous indicators for long—glacier-fed rivers were becoming non-glacial; overland flows on hill slopes were increasing; groundwater recharge was reducing drastically; natural springs were fast drying up; the base flow of rivers was dwindling rapidly; perennial rivers had become non-perennial; and, the lakes too were drying up. Yet there has been little research on the causes for this desertification. Here, we analyse one of the reasons: the changing landscape of forests in Uttarakhand. Pine forests are expanding at a rapid rate and at the cost of the broad-leaved forests of oak, rhododendron, utis and kafal. The forest department records reveal that in the forest division of Almora, over 81 per cent area is covered by pine forests, whereas oak forests are confined to a tiny area of only 2 per cent. In Champawat district, pine forests are spread over 27,292 hectares (ha), whereas oak forests occupy just 5,747 ha. Similarly, in Bageshwar district, oak forests cover just 2 per cent, as compared to 75 per cent area occupied by pine forests. Pine forests now occupy about 80 per cent of the forested area. Pine forests are the most devastating agent depleting the underground water. Recent studies carried out by the Geography Department of Kumaun University in Almora show that the groundwater recharge rate in oak forests is 23 per cent, compared to a measly 8 per cent in pine forests. Needless to say, in agricultural lands and urban areas, the recharge rate is far less. As the recharge rate of pine forest is only one-third of the oak forest, the pine forest has triggered an overwhelming reduction in the net recharge rate. So, it is clear that the most potent and the most devastating agent for the depletion of natural water resources are the pine forests. A pine tree sheds copious amounts of pine needles (pirul), which due to its toxicity is neither consumed by animals nor decomposed by microbes to convert it into humus and soil. Every year, the annual production of pine needles is overlain by the next year’s leaf fall. Thus, the pine needles keep accumulating year after year in the absence of a natural decaying process. The pine needle cover functions like an impermeable plastic sheet, which accelerates the rainfall runoff all over the area. Pine is an aggressive species. It does not require much soil to germinate. Thus, it keeps expanding through the natural process. The forest fires near the oak forests dry up their soil thus making them suitable only for the germination of pine, as it can grow even without much moisture. Pine plantations were encouraged by the forest departments during and even after the British rule for its resin, which was used for turpentine oil used in the paint industry. It was stopped only in 1993, after local people protested that pine tress were drying up underground aquifers. Though hydrologists like Rawat have made valuable suggestions—both mechanical and biological—to help replenish the water resources, we need to reverse the ratio of pine and oak forests. Some of the measures that can help arrest the devastating reduction of natural water resources by pine forests include banning the plantation of pine and a systematic removal of pine needles. There must also be large-scale efforts to plant broadleaved trees like oak, utis, kafal and burans to replace pine forests. Moreover, a government agency should be entrusted with the task to use pine needles to make charcoal and mattress stuffing. In this initiative, villagers must be given incentives to collect and sell pine needles to the designated government agency. A systematic plan is also needed to cut pine forests to be used in the furniture industry. These measures can go a long way to rejuvenate and replenish natural water resources. 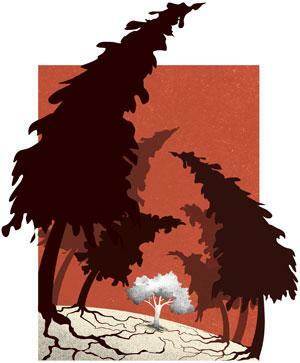 Any further delay to control pine forests can have a disastrous impact on the inhabitants and the ecology. If we can control the menace of pine, we can probably reverse the incipient desertification process of the Himalayas. (This article was first published in the 16-31 August issue of Down To Earth under th headline 'The hills are drying up').